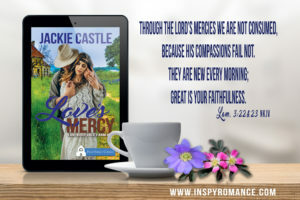 The Sweetness of Mercy… A New Book Release! where neighbors still care deeply about each other and the little white chapel on First Street is the heart and soul of all who live here. This first line of the Sweet Grove introduction had me hooked. When I heard about this Kindle World project, I wanted in. Melissa Storm’s First Street Church series isn’t afraid to tackle the hard stuff, but remains clean, entertaining, and full of the romance we all love. I came up with a three book mini-series that takes place on a dying farm, owned by a dying man who is the estranged father of my heroine, Faye Andrews. Each story is how the characters, as well as the land, begin to come alive with God’s help. And the mercy they find in a loving God who brings them all together. Today, the first book, Love’s Mercy releases. Along with several other Sweet Grove Kindle World novellas. If you’d like to read the first chapter go take a look at my Sweet Grove Book Page, where you can read the first chapter, reviews, and find some other fun things to do. There will be a lot going on, prizes to win and more over at the First Street Church Facebook Page. Hi Jackie, the idea of a kindle world sounds intriguing. Will be sure to check out your book, and those related to it. Thank you. I’ve been reading through them, and have read all of Melissa Storm’s core books, and have seriously enjoyed them. Its fascinating how so many people can take one place and make it their own, while keeping the integrity of the fictional town. I set up camp on a little farm outside of town, but my character venture in and interact with the core characters once in a while. It’s fun. Thanks for the blurb. The books looks interesting! Thank you. Book birthdays are always fun days. Congrats Jackie on your First Street Church Release! Great group of author with inspiring stories! 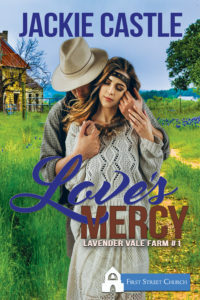 Is Love’s Mercy setting a lavender farm? On my to read list. Best wishes! Its a budding lavender farm. Excuse the pun. lol. The video is powerful and the premise & blurb of the book sound really good. Congratulations on your newest release! I’m looking forward to not only reading it, but reading all of your books. Hello, Jackie! I love your title, Love’s Mercy, because Lord’s love and mercy are limitless, and I love the way God works in the lives of your characters. Thank you Alexa. Blessings to you. Congrats on your newest! Thanks for all the interesting info here! Unfortunately, you’ll get no help resisting from me. lol. Life’s short, go for it!! Lots of good stuff there. haha. And I’m excited to see how your characters resolve their challenges, too. So much potential for conflict there! First I heard of Sweet Grove, I was skeptic, but I’ve read Autumn’s book so far and it’s really good. I’m looking forward to more stories. Thanks for sharing.